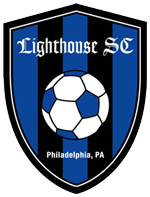 Lighthouse Soccer Club, Philadelphia’s oldest youth soccer club, is a not-for-profit youth soccer organization that sponsors programs for over three-hundred youngsters between the ages of 5 to 18 years old. Since 2012, Lighthouse Soccer Club has also fielded a Mens Open Team for players over 18. We offer several developmental programs, include several soccer skills clinics and camps, as well as an in-house training program. Lighthouse Soccer Club also fields successful youth Travel Teams and Adult Open Teams in various regional leagues including the Mid-Atlantic Premier Soccer League, the DELCO League, the Independent Girls Soccer League, Philadelphia Area Girls Soccer, the United Junior Soccer League, the Inter-County Soccer League, and the Philadelphia Dept of Recreation. Lighthouse Soccer Club is affiliated with U.S. Soccer, the Eastern Pennsylvania Youth Soccer Association (EPYSA), United States Youth Soccer Association (USYSA), and the National Soccer Coaches Association of America (NSCAA). The Lighthouse Soccer Club Board of Directors is a dedicated group committed to continuing the success of our legendary soccer club. Each member can be contacted directly via email below. Director of Coaching: Jack ONeill Jr.
Board Member: Jack ONeill Sr.
Lighthouse Soccer Club adheres to the U.S. Youth Soccer Code of Conduct.